We’re ten games into the new season and Ulster are sitting in second position in Conference B, but have a difficult run of fixtures coming up. Where do Ulster currently stand and are we on course for a relatively successful season? In short, this season is just a trial and error for Dan McFarland. He took over Ulster in an ‘official’ capacity just 12 days before the opening Guinness PRO14 fixture against Scarlets, however in that short space of time, we can see how the Englishman is wanting Ulster to play. Whereas last season we were promised that we would see Ulster ‘rip-up the playbook’, after a brief glimmer at the start of the season, the style of play reverted back to Ulster’s usual predictable self. This season has not been the case however. We’ve seen McFarland’s men place more of an emphasis on a fast tempo as well as plenty of offloads. Stuart McCloskey, Marcell Coetzee and Will Addison have all offloaded 14 times while McCloskey and Coetzee are in the top four players for offloads in the PRO14. Addison in particular has been a revelation. I was concerned for Ulster upon the retirement of Jared Payne at the end of the season but they have been able to secure the services of a player in a similar mould to Payne and it has paid off. Against Edinburgh he made a league record of 28 carries in a PRO14 match since OPTA started recording this data in 2010. However we’ve not seen Ulster create as many line-breaks as they did in the same time period last year, however you could argue that the quality of teams that Ulster have played in those games has improved. Currently Ulster have made 103 compared to 119 in the first ten matches last season. This has had a direct impact on the number of tries scored with Ulster having scored 26 so far, seven less than last season. Hopefully the most recent game against Benetton where they made just three line-breaks and no offloads is just a blip. There’ve been a few negatives with the most notable one being Ulster’s weak set piece. 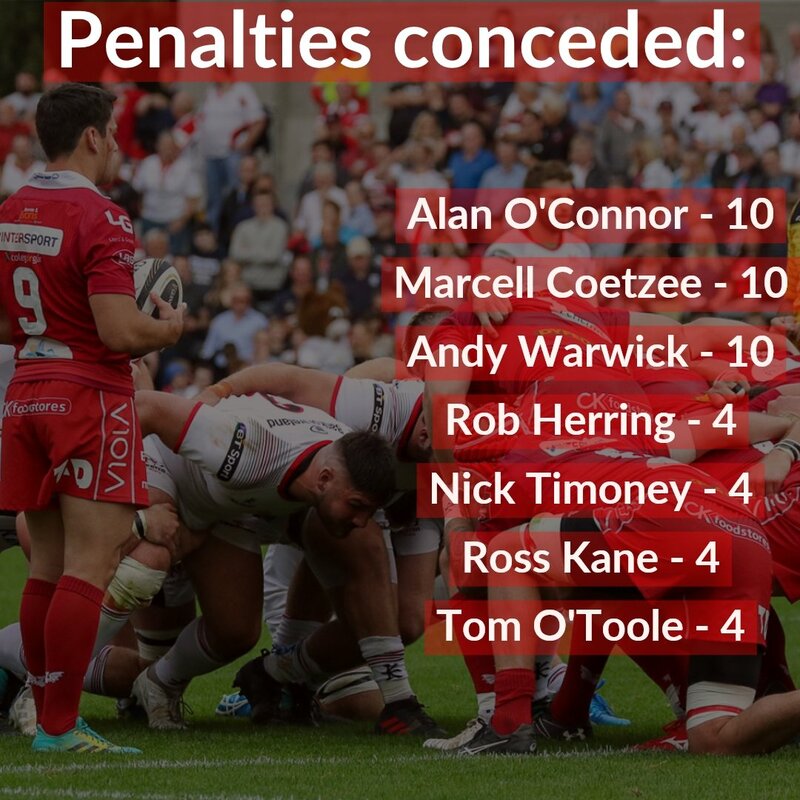 Ulster’s props have given away 25 of 92 penalties, while I don’t have a breakdown as to how many of these penalties have come at scrum time, I wouldn’t be surprised if at least half of them were. It was particularly evident in the game against Racing 92. One of their tries came directly from a messy scrum, allowing them a way back into the match even though, up until that stage, they were second best. Ultimately they stepped on the gas and ran out comfortable winners in the end. Despite this, according to ESPN Ulster have only lost five of their own scrums (three of which were against Connacht) but if you compare this to the opposition, who have only lost three scrums against Ulster this season, Ulster need to improve. Our lineout situation is worse. So far 12 lineouts have gone array however that does not account for Ulster’s sloppiness where ball is spilled but regathered without a set play move being used. An iffy lineout gives something for the opposition to target and Ulster have often coughed up possession in promising attacking areas of the pitch. Still, I think Ulster are in a better place than they were this time last season. Five academy or sub/sub academy players have made their debuts since the season kicked off with Michael Lowry and Eric O’Sullivan impressing. O’Sullivan is one of four players to have featured in every match so far, albeit his appearances have predominantly come from the replacements bench. Fellow Banbridge player Michael Lowry made his debut against Munster before excelling against Leicester, Racing 92 and Dragons. The fleet-footed former RBAI schoolboy has a good turn of pace, evidenced by his first try against Dragons as well as his break against Leicester Tigers. Lowry’s average metres per carry of 8.6 is the highest of players to have made more than 40 carries. Angus Kernohan crept onto the Ulster scene at the start of the season and has been a part of every match day squad with the only game he has not appeared in being against Edinburgh. It’s difficult to judge as he’s just played just 359 minutes in those nine appearances and only started three games. Still he’s looked quick to the break and solid defensively. In addition to this we’ve seen players who made their breakthroughs last year push on. Tom O’Toole has only played 254 minutes in his seven appearances but of the props who have made appearances this season, he has the best average metres per carry of 2.1. 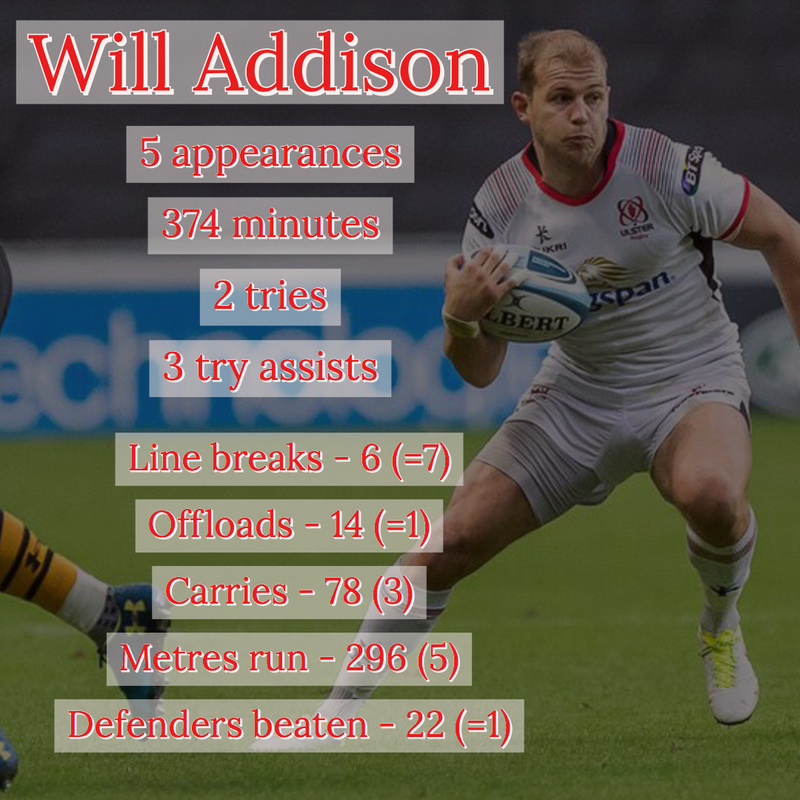 Indeed he sits above average in that carry for Ulster’s forwards. Ulster have a really tough run of fixtures coming up. The international window usually brings doom and gloom for Ulster and with a trip to two trips to Llanelli, a trip to Galway and home matches against Scarlets and Munster, things have the potential to go majorly wrong heading into the New Year. Losing bonus points in their away fixtures would satisfy me as long wins at home are recorded against Cardiff, Scarlets and Munster. With the things that fans, staff and players have had to endure over the last year, I think Ulster have turned the corner. Ulster have had good showings in August’s IRFU U18 Festival of Rugby and in the Celtic Cup and Kieran Campbell and Willy Anderson seem to be working wonders with academy. While progress is and will be slow, Ulster are building foundations for a better future.